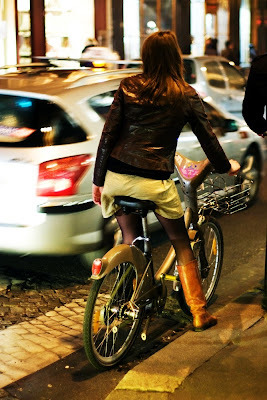 "I was in Paris last week-end and enjoyed seeing so many people riding bikes with the new rent-system called Vélib'. The weather was just great for the season and I just couldn't resist to send you this picture I took Saturday night, near Saint-Germain-des-Prés, one of the most interesting areas in Paris. And let us enjoy some more nice pictures from Copenhagen, a paradise of bikes for us living in Spain!" Thanks, Bruno! We're working on more photos from Copenhagen. Stay tuned! Thanks for the comments for this photo I took last week-end!